That One Spooky Night by Dan Bar-el. Review: Do you believe in witches, sea-monsters, mermaids or even vampires? Do you want to read a quick story about them? If so, try That One Spooky Night by Dan Bar-el. 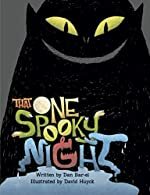 This graphic novel is illustrated by David Huyck, and it contains three short stories that portray how spooky all of them can be on one unusually scary night. In the first story, the reader meets Giselle, who can't decide what to be for Halloween. Next, Anthony and his brother, Alexander, are transported to a world they never knew existed. Then, in the final story, a group of girls discover some unlikely friends. In "Broom with a View", the first story, Giselle has trouble deciding what she will be for Halloween. After she finally makes a decision, something strange happens and her spooky night begins. You'll just have to read in order to find out about what tricks or treats follow. The second story, "10,000 Tentacles under the Tub", is about the spooky adventure that Anthony and Alexander encounter in their bathtub. After a wild and playful Halloween night, they discover something unusual in the tub. How will they handle what they find lurking below? Read this story to reveal their findings. In the final story, "The Fang Gang", what do you get when you taunt girls about their Halloween costumes? A scare, that's what! When a group of girls gets frightened, they improve their costumes to scare those who dare to taunt them. On their journey they run into a frightening bunch called the Fang Gang. What will happen when they meet these friends or foes? Read "The Fang Gang" to uncover it all. I love the author's original ideas about children on Halloween. In my opinion, the best part of That One Spooky Night is that it is a graphic novel. The illustrations help make the characters believable and well-rounded. Unfortunately, there are confusing subplots within the three short stories. Many times, I had to re-read some parts of the stories because I thought I had missed a page. However, the theme is unique for a Halloween comic. The author's writing style is descriptive and original, with an immediate comedic effect. In my opinion the stories are a little predictable, because the reader can pretty much sense what comes next. I recommend this book to all graphic novel fans, because overall it was a great book. We would like to thank Raab Associates for providing a copy of That One Spooky Night for this review. Have you read That One Spooky Night? How would you rate it?